One of the benefits that DH and I have discovered about living in St. Louis is that we are fortunate enough to live in a community that is really hot on the trend of supporting locally grown food. It seems like every small municipality between us and the river has their own farmer’s market. And our chefs and independent grocer’s are supporting farmers from all over the St. Louis region. DH and I have joined on the bandwagon – we have joined a CSA this year. There were many to choose from, but I ended up picking this particular farm because they would do personlized deliveries to my door. (I love the idea of a CSA, but the requirement to be somewhere between 5 and 6:30 one day a week to pick up our share just doesn’t conincide with the Murphy’s law of consulting that a client will always call 5 minutes before you need to leave). So they start deliveries next month! I can’t wait to see what we get each week. DH and I eat a lot of produce, but it will probably be good that DomesticSis also joins us every now and then. In the meantime, I have been searching for ways that I can use to maximize my produce usage in ways that doesn’t involved a specific dish cooked around a specific veggie. I love my vintage bowls. They were my grandmother’s – I’m sure she’d be surprised to see them! Rinse quinoa until it becomes clear. Heat olive oil in a large skillet, add the onion, green bell, garlic and pine nuts. Cook until onions are translucent. Add the quinoa and allow it to toast slightly. Add water and a little salt. Bring to a boil, then turn the heat down so that quinoa and water are simmering. Cover the pot, allowing some room for steam. 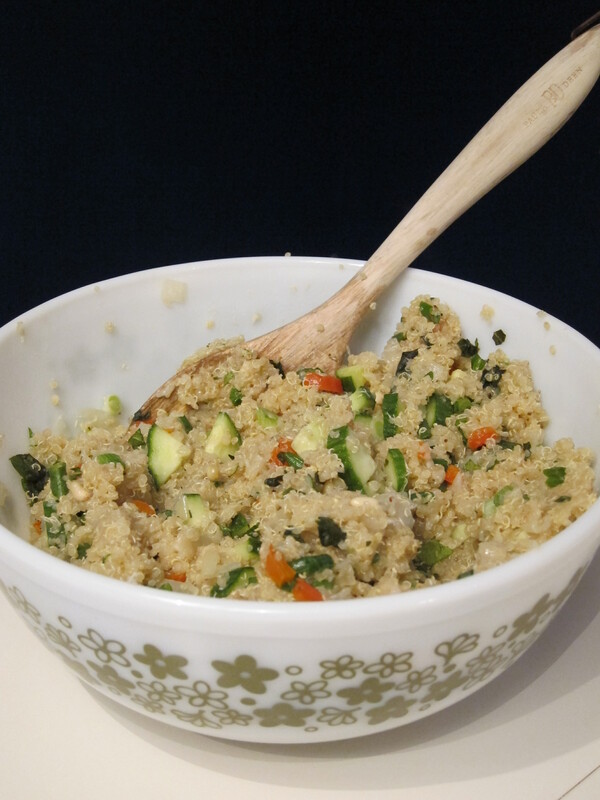 Simmer for approximately 20 minutes, or until quinoa is tender and water is absorbed. Remove from heat and add to a serving bowl. Stir it to perk it up! As the salad cools, add 2 – 3 tbslp of olive oil, and if you’d like, some balsamic vinegar to taste. Add the herbs and the cucumber. Season with Salt and Pepper. This would probably also be good with a little feta cheese – I just didn’t have any on hand. Enjoy! Makes 4 – 6 servings, and works beautifully for health lunches with a side of protein! 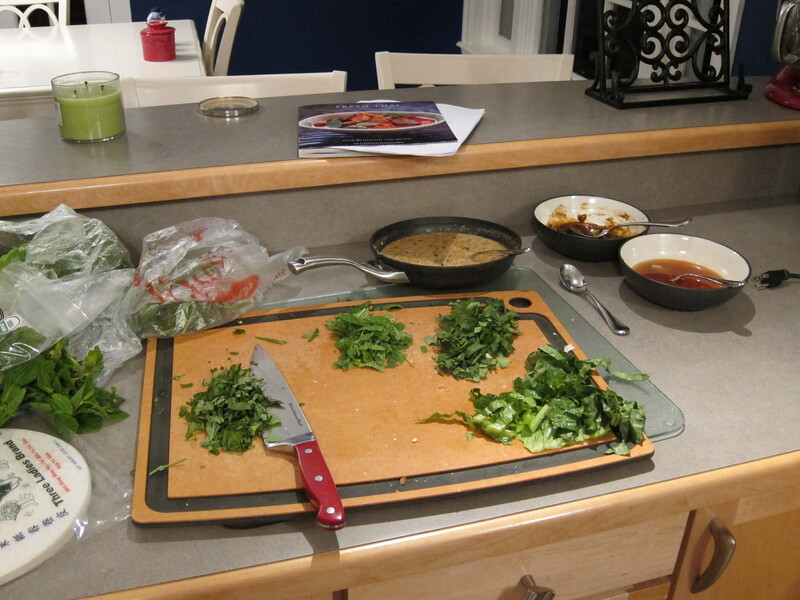 Earlier in this blog, I have made many references to my love for Thai take-out. A close second is Vietnamese Pho, especially the Pho from Pho Grand. So one Sunday afternoon, searching for a diversion from CFA studying (which really looks like a bad idea now, in retrospect), my DomesticSis and I decided to throw ourselves a little Thai/Vietnamese party. 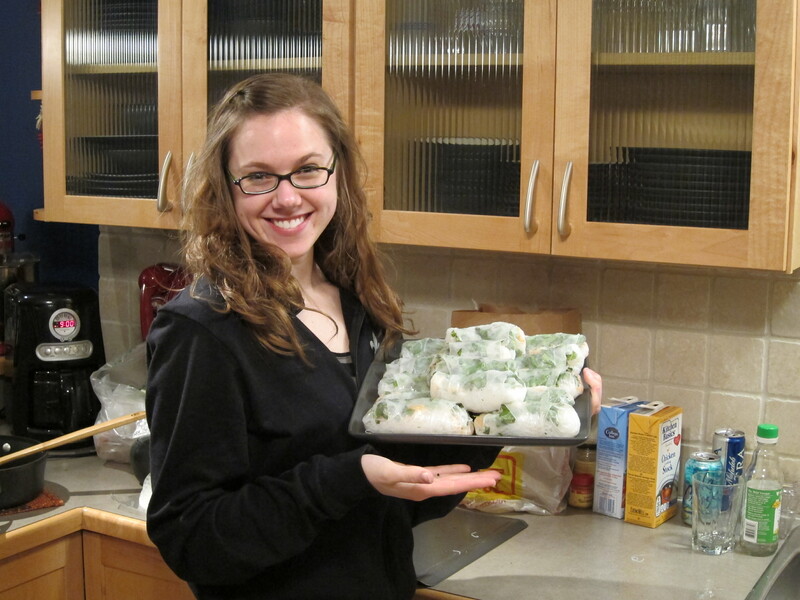 Actually, DomesticSis just wanted to make spring rolls. I was the driving force behind turning it into a little party. On the menu? The Soup was a little disappointing, so the recipe will not be showing up here (although, I will continue searching!) 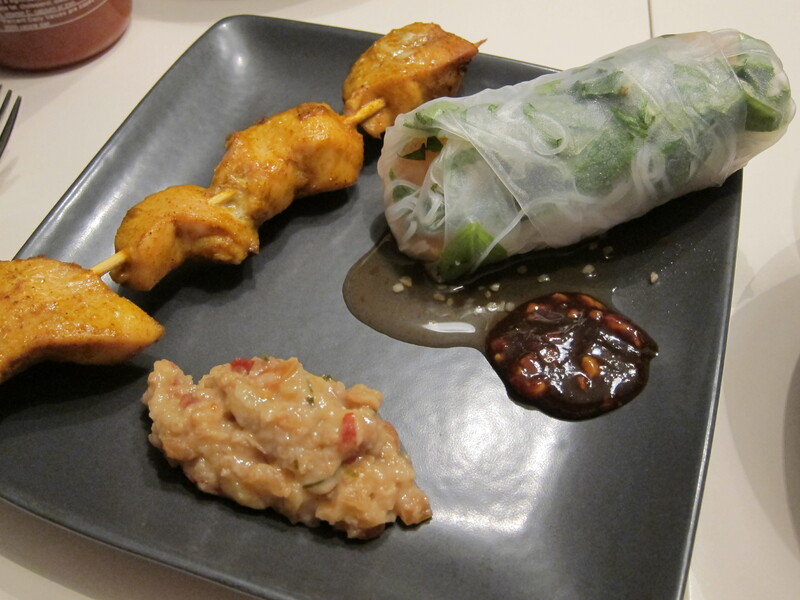 The chicken satay and spring rolls were awesome! I had looked for a good tutorial on spring rolls earlier, and could not find one. So, I’ll share how DomesticSis and I put it together. We’ll get to the dipping sauces in a minute. Trust me, you will want to go there. First, we placed everything out on the board. Herbs and Herbs...guess what will be planted in the garden this summer? 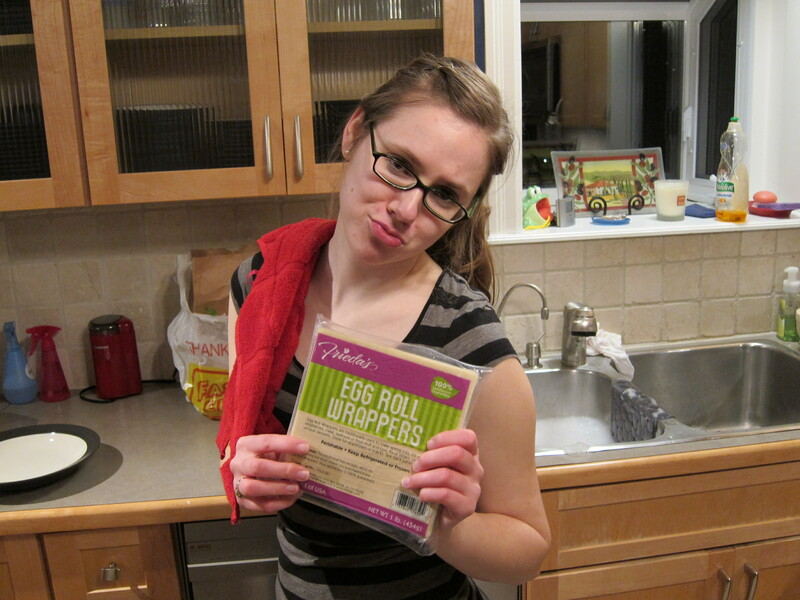 Then, we had to make sure we had the right kind of wrappers! Thank goodness the international food market is five minutes away from our house! Yep! And, 60 wrappers for all of 3 bucks! And now, for the assembling! 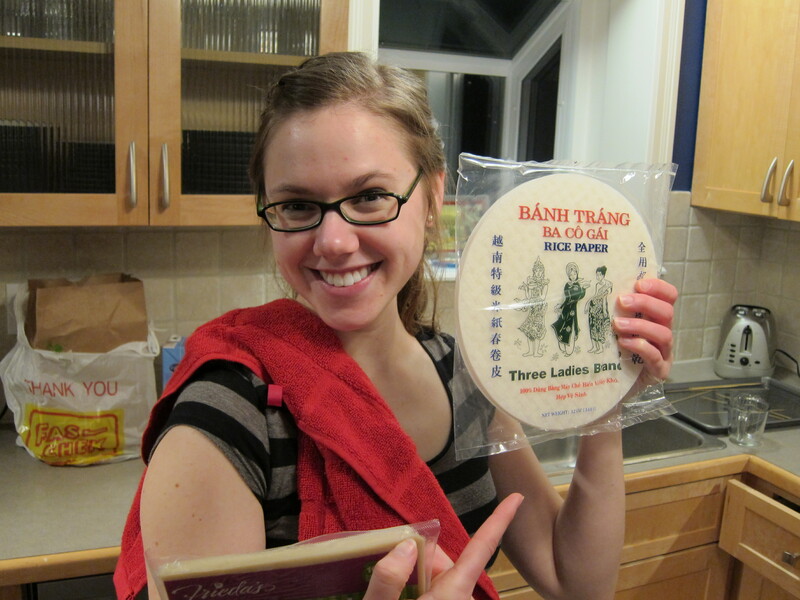 First, moisten a rice paper wrapper in a bowl of warm water – about 2 – 3 seconds. Then, lay out on a cutting board. Add the vermicelli rice noodles, layer the shrimp, and then top with the lettuce and herbs. 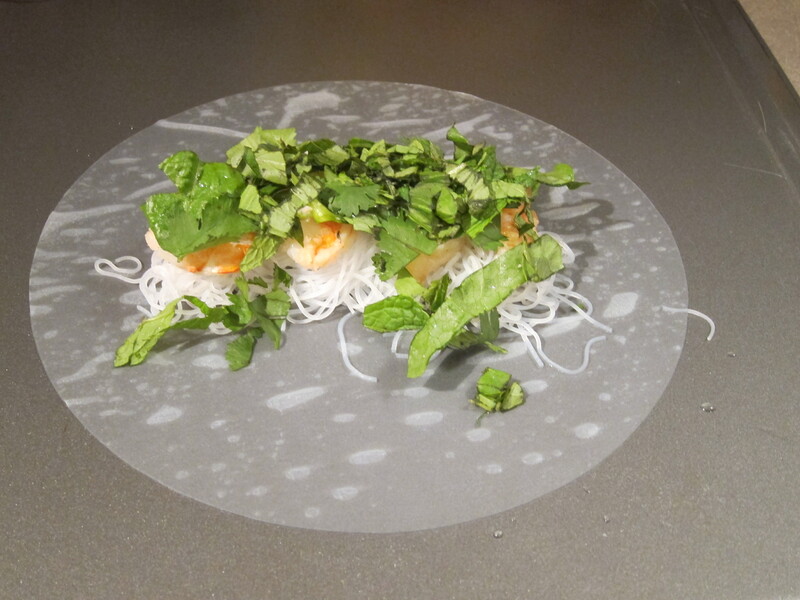 Fold in both the left and right edges, then roll the rice paper. It will stick together without a problem. And they will be beautiful! DomesticSis and I were quite proud of ourselves! Lastly, but perhaps most important, the sauces! Typically when we’re at Vietnamese restaurants, we see spring rolls served with a fish sauce. 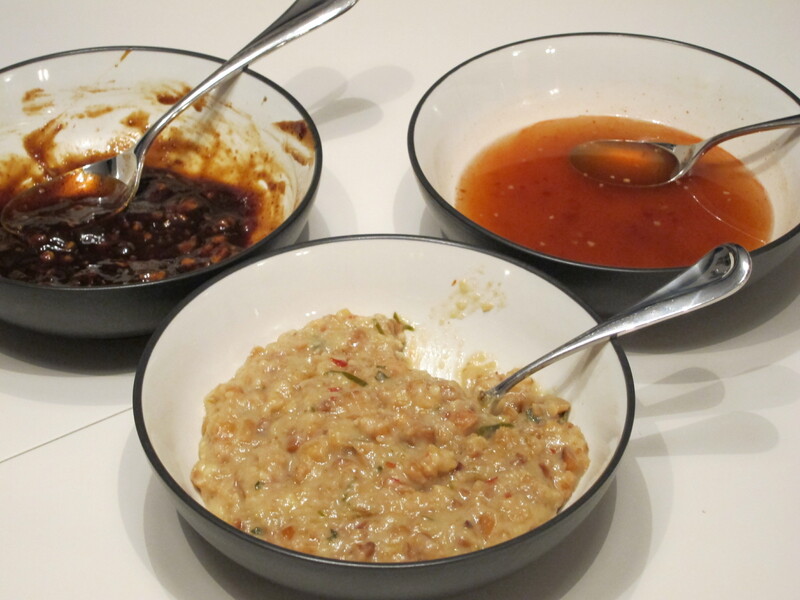 But sometimes they’re also served with a hoisin sauce as well. So that’s what we did. I totally cheated on the hoisin sauce – we simply took store-bought hoisin sauce, added water to thin it, and topped it with chopped peanuts. Yum! 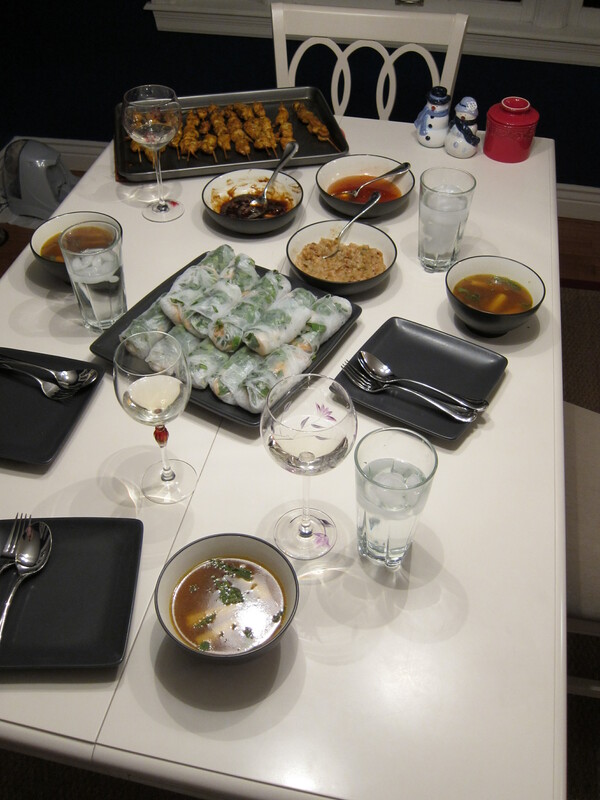 Aside from the wayward soup, it was a successful Thai dinner party! I highly recommend trying these spring rolls this summer! Especially when you have a little surplus basil growing in the garden!